Whilst building a home on an elevated block can often bring sweeping views and more natural light and breezes, it can more often than not be more of a headache to get the house built. With an abundance of sloping blocks available on the market within the Sydney Hills District, it’s important to understand a number of factors that could affect your decision before you take the plunge and purchase the block. An important factor to consider when choosing your builder is how your land is positioned. Many builders will offer a standardised set of designs whereby you will be able to make some design alterations. However, the challenge lies in modifications of plans to suit blocks on varying angles. In many cases, this will more often than not involve complete flattening of slopes and excavation of the land to make it flat enough to suit standard designs but this is where unexpected costs can build up. Despite common thought, you can find very competitive prices for custom designed homes and the lie of the land can lend itself to more creative scope in terms of design, whereby the house is built to the best attributes of the land. Where do the additional costs come from? Failure to design a home to suit the landscape can impact the cost in a number of ways. Whilst not a comprehensive list, generally speaking major cost increases can arise in the following areas. What are the benefits of a custom build? A house designed specifically for the slope of the land it the best way to get the most out of the blocks best attributes, and won’t leave you with large portions of unusable backyard. Stepped and split level homes are often the best choice and more adaptable to the shape of the land. Designing your home for your specific block can also help to keep costs down and you won’t be faced with extra site costs from excavation work or expensive landscaping on unusable portions of land. In reality, custom build prices can be fairly on par with standard project builds. Do your research and make sure you choose a builder who has experience with custom designs and can provide you with all the information you need to make your design choices. 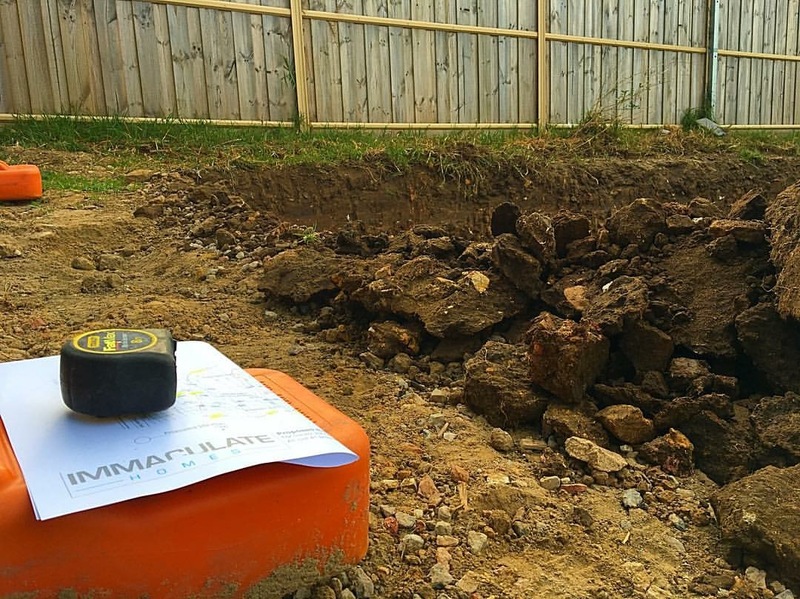 At Immaculate Homes, we design homes to suit the both the size and shape of your block, including the slope. We aim to reduce unnecessary costs as much as possible whilst creating a unique, aesthetically pleasing home suitable for the landscape and its surrounds. Contact us on 1800 YOURHOME or via the ‘Contact Us’ tab to discuss building on your sloping block. In light of the most recent storms throughout the Hills District, we have had a number of clients contacting us to ensure they are making the best decisions with their roofing and guttering plans. Metal or tiled, fascia’s, no fascia’s, insulated or not. With an increasing number of roofing options available when building or renovating your house, it is important to do the research and decide which is the best for you to protect your property from day to day weather as well out of the ordinary weather events like flooding, hail and bushfires, whilst at the same time maintaining aesthetic appeal. Additional factors to take into consideration are the cost, maintenance, and functionality of your chosen roof, all of which can either limit or increase the options available to you. Contact Immaculate Homes on 1800 YOURHOME today to find out more about these options for your upcoming project.